Jeppesen recently signed a new service agreement with Turkish Airlines, one of the fastest growing airlines in the world, to provide a solution for crew tracking and manpower planning. Turkish Airlines, a Jeppesen crew pairing and crew rostering customer prior to signing the new service agreement, will now operate with a total integrated Jeppesen crew management system. The crew management system provided by Jeppesen will allow the airline to integrate powerful decision support throughout their entire crew management process, from long-term forecasting to day-of-flight operation. The Jeppesen manpower planning solution is used for long-term planning of crew, to balance resources and to level peaks of demand. The crew tracking system will ensure efficient operation and cost control by implementing automatic problem detection, alert functionality, and proposing solutions produced by performance analysis technology. The manpower planning and crew tracking system also includes a crew recovery module, allowing Turkish Airlines to utilize powerful optimization technology to quickly determine cost-efficient recovery solutions. The entire system is designed to increase operational efficiency while meeting the demands of a rapidly evolving airline business environment, by allowing for customization of the crew solution suite that integrates seamlessly with airline operating systems. 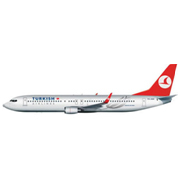 “We are excited to extend our partnership with Turkish Airlines and to extend the installation into a fully integrated crew management suite," said Thomas Wede, Jeppesen senior vice president and general manager, Aviation. “Turkish Airlines is working diligently towards their goal of becoming a global brand in the commercial aviation sector. Our industry-leading crew management solutions will work to help them achieve that long-range objective." For more information on the industry-leading crew management solutions provided by Jeppesen, please visit our commercial crew management site. Established in 1933 with a fleet of only 5 aircraft, Star Alliance member Turkish Airlines is today a four-star airline company with a fleet of 142 aircraft flying to 166 destinations around the world, comprising 39 domestic and 127 international destinations.